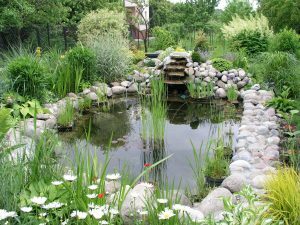 Whether your property has a waterfall or a pond that includes fish and or a watergarden, The Good Water Guy’s natural oxygen system will keep your water features free of algae (including string algae), all while eliminating scale on the natural rock, or murkey water. It is recommended you select our fully automated system with carbon dioxide control and with our Universal Water Filtration Technology we can reduce time to eleven minutes once per week for you or your service personnel (twice per week with fish, can be done with feeding). 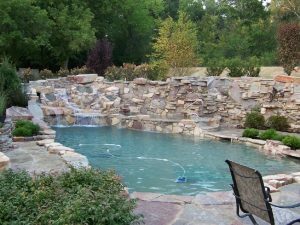 A 60,000 gallon, million dollar plus Koi pond in Flower Mound, TX converted to ECOsmarte in Year 2000 and features a twelve foot deep water garden. CO2 is injected 24/7 and sulphuric acid is used as a back-up in high heat months to reach a target pH of 7.4 to 7.5. Bubblebead biological filters, ZEOsmarte high rate sand filters, and Commercial Well Water Treatment System on the source water yield mirror quality water (.1ppm to .15ppm copper is needed to maintain absolute clarity and is below the Koi copper toxicity level of 0.3 ppm).